What do you get when you put together catchy, clever, upbeat songs with the beautiful voice of children's performer Meredith LeVande? You get a great C.D. filled with songs kids love...titled "What Are The Odds?" 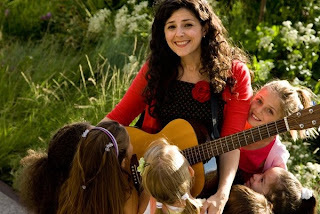 Meredith has a deep commitment to putting the child back into children's music and she is doing a fabulous job of it! Five years ago Meredith debuted her first album titled "Monkey Monkey Music With Meredith Levande". Her latest title "What Are The Odds?" which features fun songs such as "Shake It Loud", "Bubbles", and "Who's A Knockin' " will be released August 31st, 2010! 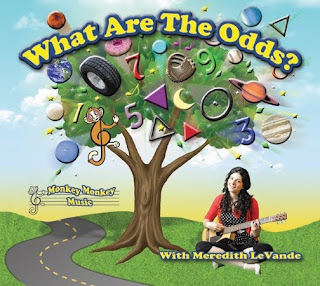 I had the pleasure of reviewing Meredith's "What Are The Odds?" C.D. and as a parent I have to say it is truly quality children's music! I listened to all the tracks with my girls and we had a blast dancing along to these fun and upbeat songs! The girls and I really enjoyed the song Who's A Knockin'. It features fun knock knock jokes that had us all laughing! We also loved the song "What Are The Odds?". This song is great because it teaches kids how to count using odd numbers and they don't even realize they are learning with the fun upbeat melody! I would recommend this wonderful C.D. to anyone with young children! Pre-Order Your Own Copy of "What Are The Odds?" Want A Chance To Win A Copy Before You Can Buy It? One Reader Of Textbook Mommy Will Win Their Very Own Copy Of "What Are The Odds?" To Enter: Simply comment that you would like to win! 1. Follow me by RSS reader or Follow my blog through Google Friend Connect. For each of these put a separate comment for 1 extra entry! 2. Add the Textbook Mommy button to your blogroll or post my button in your blog sidebar. Please add 3 separate comments for 3 extra entries! 3. Blog about this giveaway! Please add 5 separate comments for 5 extra entries! 4. Become a fan on the Textbook Mommy Facebook Page! Please add a separate comment for 1 extra entry! 5. Follow me @TextbookMommy on Twitter and/or retweet this review/giveaway. (You can find my handy retweet button at the top of this post) You can retweet no more than once every four hours each day for extra entries. Please add a separate comment for each of these and for each retweet for 1 extra entry each! 6. Join My Blog Frog Community HERE! Please add a separate comment for 1 extra entry! 7. Stumble this post, not my blog and leave your Stumble Upon name in a separate comment. (You can find my handy Stumble Upon button at the bottom of this post) Please add a 2 separate comments for 2 extra entries! 8. Leave a comment on one of my other blog posts! Please add a separate comment for 1 extra entry! WINNERS WILL BE DRAWN BY RANDOM.ORG AND POSTED ON MY BLOG WITHIN 24 HOURS OF CONTEST END. WINNER HAS 48 HOURS TO RESPOND TO MY EMAIL OR ANOTHER WINNER WILL BE CHOSEN. Disclosure: The above review is my honest opinion. The company named above donated a product for giveaway in exchange for this review. You can read my full disclosure policy HERE. Yes, I would like to win!